Sandy and I spent most of the first day of our vacation getting to the Amtrak station in St. Paul, Minnesota by plane. We found a cheaper way to park near Raleigh Durham Airport through a service that contracts with nearby hotels to use their parking lots and airport shuttles. The one we used saved us about half of what we would have paid at the economy lot and it was a good hotel in a nice area: One Stop Parking. What a good idea for a business. Then we flew to Minneapolis by way of Atlanta, where our plane was delayed for an hour because someone broke a seat in the exit row and it had to be replaced. I thought that we were still okay on our schedule because I had planned on an extra hour to get something to eat before we got on the Empire Builder at 10:20 p.m. that night. I was wrong. Mainly I was wrong about the quickest, easiest way from MSP airport to the Amtrak depot in St. Paul. I thought that it would take about 30 minutes by light rail. Don’t ask me how I got this information. I must have dreamed it. At 9:45 p.m. I looked at the number of stops before the depot and it began to dawn on me that there was a good possibility that we would miss the train. I decided to call the station from the Metro and was thwarted by a phone robot that did not understand my answers to its questions. This quickly got worse after two gangs of drunk young teenagers surrounded us in the car and started screaming accusations at each other about a stolen bike. Finally I got a human on the phone and I was nearly crying. I shouted into the phone that I couldn’t hear them for the yelling around me and that we were almost there and we’d be running with our luggage but we’d get there at probably exactly 10:20 and could they please, please, please hold the train for a few minutes? Miraculously, I barely heard the agent say that they would hold the train for eight minutes. This is not the way I envisioned beginning our vacation. The man behind us said he was going to North Dakota. The teenager told us to have a good trip and the whole group got off the Metro at the stop just before the depot. At this point we jumped up and started getting our luggage ready to run for the Empire Builder. I shrugged on my backpack and let go of the pole to adjust it. The train shifted and I fell backwards; the backpack and my elbow taking the brunt of the fall. North Dakota Man helped me up and pointed us in the right direction. The depot was huge and there was a high school prom going on in the middle of it. It was confusing to say the least. But we did it. We made the train. And Amtrak helped. We collapsed into our sleeping bunks, exhausted, in pain, and jacked up from the adrenaline. I got very little sleep that night. But at least neither of us would be driving the next day. 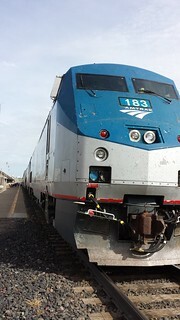 We were passengers on the Amtrak Empire Builder. More to come. The rest will involve way less drama and way more photos, trust me.